Ironbridge in Shropshire is a small town on the River Severn at the heart of the Ironbridge Gorge. Ironbridge developed around, and takes its name from, the famous Iron Bridge. The cast iron bridge of 30 metres was built across the river in 1779 by Abraham Darby III (grandson of the first Abraham Darby) which was originally designed by Thomas Farnolls Pritchard and is now only for pedestrians. By the mid 20th century Ironbridge was in decline and in 1986 the town became part of a UNESCO World Heritage Site and has now become a major tourist attraction. Most of the industries are now museums or tourist attractions one exception and that is the Merrythought Teddy Bear Company which was established in 1930 and is still going strong and also has a small museum. 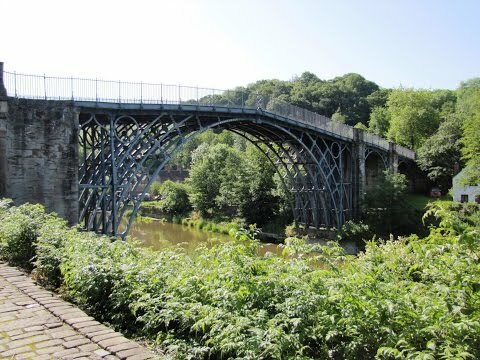 There are ten museums in the Ironbridge Gorge area to visit, the entrance fees are variable but a passport ticket can be purchased which allows repeated daytime admission to visit all the museums and is valid for a year. The museums are in an area of six square miles they are as follows Blists Hill Victorian Town, Enginuity Museum, Coalport China Museum, Jackfield Tile Museum, Coalbrookdale Museum of Iron and The Old Furnace, The Iron Bridge and Toll House, The Museum of the Gorge, Broseley Pipe works and lastly The Tar Tunnel. The Coalport Bridge also made of cast iron was built in 1818 and restored and strengthened in 2004. The single file bridge still takes vehicles limited to one car at a time. There is also The Woodbridge Inn with some bench tables on the river bank for you to enjoy in the summer. Coalport is a small village on the River Severn about 1 mile downstream of Ironbridge. It is situated on the north bank opposite The Jackfield Tile museum. Coalport once had two railway stations one of the lines is now The Severn Way and the station house is a private house and also two ex-British Railway carriages have been converted into holiday accommodation and are situated between the platforms. The Coalport Canal which runs through the village fell into neglect and was in filled in the 1920s and then was partially restored in the late 1970s with further restoration in the 1990s. Coalport was also home to the pottery founded in 1795 by John Rose producing Coalport China which became very popular and then became part of the Wedgwood group companies. The pottery, now a youth hostel, moved across the canal to the now Coalport China Museum and in 1926 moved production to Staffordshire. Coalbrookdale is another village in the Ironbridge Gorge where there is the massive railway viaduct and a settlement which bears the history of iron ore smelting. The Museum of Iron is very important to the early iron industry and shows a fabulous collection of fine art castings, including statues, benches, tables, plaques, fire surrounds and other works of art. The remains and history of Abraham Darby’s Old Furnace sits in a large glass house where it all began 300 years ago. This is quite a large lawned area with seats where you can sit, relax and enjoy this wonderful place. We park at the side of the road on the Wharfage near the White Hart pub and walk along the river side to the Iron Bridge. We cross over the bridge and turn left through a car park then take the path, Severn Way, through the trees with the River Severn on our left. We keep heading forward, catching sight of Bedlam Furnaces through the trees on the left, until we come to Jackfield Sidings and then carry on forward. We pass Jackfield Tile Museum on our right then a little further on the path splits into two and we take the left one signposted The Boat Inn. When we reach the Maws Craft Centre we turn left then right and then passing some houses we walk forward. We then arrive at The Boat Inn and then follow the road round to the right and keep going right round the bend going back on ourselves for a short way and pick up the path on the left back on to the old railway track. We then carry on forward until we come to The Woodbridge Inn in front of us and Coalport Bridge on our left. We go over the bridge and take the path on the left signposted Silkin Way then walk forward, the river on our left, for a short way until we reach the Brewery Inn. We then take the path through a gate opposite the inn and turn left for Madeley. We follow the path, an old railway bed, passing some houses on our left and then the sign for Coalport points straight ahead. We pass under a wide bridge, called The Great Hay Incline, and what looks like a broken platform and keep heading forward. When the path gets close to the road look for a post with a yellow sign turn left here and this takes us over a tiny stone bridge over a stream to the road. We turn right onto the road going uphill for a short way then immediately after the building on the left turn left and take the permissive footpath through a gate. We follow this round and go through another gate onto a track we turn left and immediately right at a signpost, and take the steps steeply up hill. First we take a look at the kiln just to the right of the steps. We come to a crossroads of paths and we head steeply up the steps ahead of us signposted, Ridge Way. We carry on through the woods until we come to a track with a seat in front of us we turn left and follow the sign for Ironbridge. We keep heading forward until we come into a field with the Power Station towers in front of us and houses on our right. We head over the field slightly to the left to the wood we turn left at the sign and follow the path downhill until we come to a sign and a seat here we follow the path for Benthall View there is an open space on our left we head upwards and follow the path which brings us out at a car park area we walk forward over the car park into Benthall View and follow the road round. Then at the end of the road we turn left to the main road where there is The Beacon pub on our right and Moores grocery shop on our left. We cross over the road and walk in front of the houses into Roberts Road and follow the road round the bend to a t-junction we turn left into Beach Road. After a short way we pick up a path on the right signposted Woodside we follow the path round to the right then turn left at the road signposted Ironbridge Way. Just after the bus shelter we turn left along a path and at the end we go straight ahead between a hedge on the right and a field on the left. We carry on forward until we come to a picnic table at a crossroads of paths and a large open space. We take the path opposite slightly to the left with two posts with yellow arrows on them. The path splits and we take the left one and follow it round to the right then it splits again and we take the left one over the grass with posts. We head forward then drop downhill into the wood and turn left and follow the path until we come to a track and we turn left for Coalbrookdale. We come out at the road in Coalbrookdale but before we turn left and follow the road we go straight over to take a look at the viaduct and then for a walk round the grounds where the Museum of Iron and The Old Furnace are. We then head back to the road and follow the road passing some old derelict houses on the left and two pubs, The Coalbrookdale Inn on the left and The Grove Inn on the right, both opposite each other and close to the edge of the road. At the end of the road we turn left back to Ironbridge and where we started. An easy to hard walk with some very steep inclines and declines. Approx 8.5 miles using OS map 242. The Wharfage in Ironbridge, Shropshire. There are two car parks one at each end of Ironbridge and also on the roadside. From Telford take the A5223 then the A4169 south towards Much Wenlock and then take the small road on the left for Ironbridge. There are public toilets at all the museums except Tar Tunnel and Iron Bridge & Toll House. For refreshments there are plenty of shops, cafes and pubs in Ironbridge. There are six pubs on route, The Boat Inn, Woodbridge Inn, Brewery Inn, The Beacon Pub, Coalbrookdale Inn and The Grove Inn.